Fishing is really a confusing activity for me – at least the part that people find attractive. After spending enormous amounts of money on all sorts of odd-looking gear and colourful hooks, you hang on to a rod in a boat that’s not really going anywhere. If by some remote chance a fish does bite, you haul the slimy thing in and try again. At the end of it all you eat fish, which is nice, but not exactly in the same area code as coconut cream pie! I’ve tried fishing. It involved a lot of well how do I put this gently – nothing (with apologies to Seinfeld). After many times of getting bored, finally my luck broke and there was that one time I caught eight fish in 10 casts. Then I quit. That’s when I knew fishing wasn’t exactly my passion. Imagine scoring a few goals in any other sport, then quitting out of boredom and not waiting around to see who won? Caught in flight, this black tern looks like it’s lazily fishing but it was everything I could do to keep following it around with my lens. They are quick! I’m not a half empty kind of guy (ahem ahem) so I kept looking for a way that might make fishing fun. Black terns came to the rescue. When these rascals fish, they add a serious fun quotient! They fly around all erratically, then dive bomb into the water when they see something tasty. If they catch it, they buzz the tower and look pretty proud of themselves. And rightly so! PS If I haven’t poked fun at something you like or enjoy it’s only because I haven’t got around to it yet! It’s coming. I’ve come to the conclusion the only Krahnpix readers left are ones with a sense of humour. Thankfully you are the best kind. Cool shots, great dive catch and I love the low light! Thx. It was a special evening when the planets aligned for me. It was one of those special moments when so many things came together. Glad you enjoyed it. Magic! Beautiful work with the Terns. Thx. They made a magical evening for me. Now if only I could find fox kits!! Oh wow Lyle – these are stunning photos – even by your standards! Thx. It was a particularly good evening. The first photograph is stunning. Thanks so much. It was an amazing evening and I was pleased to get this unique memory of it. Love that golden light silhouette, very nicely done. It’s funny, over the weekend we went over to one of the ocean piers to maybe get a weather shot. There were quite a few people out there fishing with tons of gear, and my first thought upon seeing was this was (besides how boring it all looked) why don’t they just leave the fish alone? Ha – leave the fish alone is funny and great question. Especially when I’m told it’s often not about catching anyway. What incredibly beautiful photos! Thanks for sharing – that first one is certainly a treat to the eye/brain, and one of those photos one could wander through for a long time… That splash corresponds to the wings so perfectly that it almost hurts (that’s how beautiful it is). I’ve never done the fishing-for-sport thing, just fishing-for-food. Doing it next to expert fishers like terns is not very inspiring – but still great to watch (so much so that one forgets the fishing part). You did a great job catching them doing what they do best! What a great post. As usual, I find myself smiling more and more broadly as you go on…:-D I loved the fishing narrative but the description of the Tern fishing was absolutely classic! Those terns must have just struck a chord with me – glad they resonated with you. It was one fun evening. How could you possibly find fishing boring? Krahnpix has definitely taken a tern for the worse. What Mike says above is true…we spend hours waiting for something to happen only to, more often than we care to admit, head home with our tripod/tail between our legs sadly admitting another day without our masterpiece. Although I am rarely photographing wildlife, too many times I have stood in the dark waiting for a glow on the horizon, a spectacular under-lighting of the clouds just before sunrise or a brilliantly clear sun in the form of a star rising majestically above the horizon only to see a cloud bank settle at the distance leaving just a thick grey sky to show for my patience. The amazing part is that we go out and do it again tomorrow. Just kidding about Krahnpix…I don’t fish either. Just one good tern and all that stuff. And I forgot to compliment you on the shots…especially numero uno. Although I don’t shoot birds, I have tried to follow terns with binoculars and it’s a challenge. Nice work. Great use of the word tern and I’ll never look at a tripod the same! Funny and well done! Every endeavour has its groupies and we seem to be a lot more patient with the activities we like. It truly is amazing we go out and do it again. Glad you liked the terns. I’ve never been able to catch them like that again – I guess that was my tern. I’ll have to check it out. I’m all in favour of humour! I actually just ordered it. Crazy. I have recommended it several times without having one of my own. Great captures, I learned on this trip that birds in the wild move fast! That is why I have so few photos of them.i love how terns hover, thendive ! Beautiful light. Every time I try to capture terns I am reminded of their blinding quickness. It makes me grateful for this one night with so many chances to fail and incredible light that I’ve not seen again. Glad you liked them. You do have to watch out for some of those trees – some of them are tricky!! The funny part of fishing is that usually the things that people mentioned they liked the most about fishing had very little to do with fishing but there was nothing wrong with the locations. Glad you liked my terns. Oh! I do like your kind of fishing. It stays with you far better than a fish dinner. These latest shots are mind-boggling. Truly impressive. Just keep doing what you’re doing. Something told me that you would enjoy that kind of fishing. I really appreciate you encouragement especially after so many attempts that weren’t worth saving. Fantastic captures. 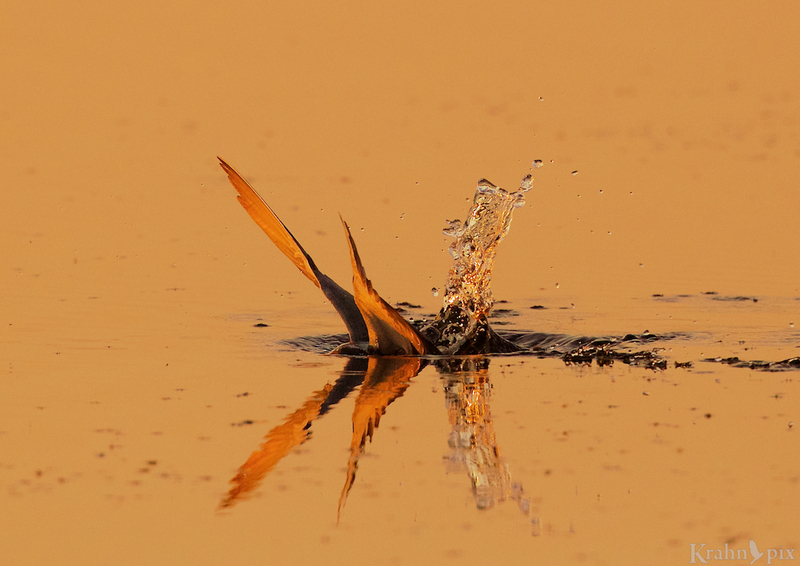 It’s not easy getting a photo of a bird as it hits the water (in a pleasing composition). That last image, which is almost a silhouette, is just perfect. It was one special evening with lots of opportunities to keep trying so I eventually was able to get some good shots. I may have to enjoy these since I’ve got not close since but then I never know when another opportunity will turn magical. As you rightly pointed out, the partial silhouette works well in the last one – glad you enjoyed it. Beautiful photos ~ really love the last one. Your take on fishing is good, I like fishing because to me it is a free-pass to be lazy 🙂 While I seldom fish, when I do go out I like it is because of the small scenes of nature out there, and next time I will have to take my camera gear (although I think my clicking would annoy any true fishermen to the point of throwing my camera overboard…hmmm, may keep my Canon at home and rent a Nikon for the day just in case that happens). Cheers, enjoy the weekend. That’s funny! I didn’t realize the fishing crowd would resort to such drastic measures! Of course given annoying interruptions I’m not sure I would trust the photography crowd to stay perfectly behaved either – starting with me. You have a great weekend too. Such elegant birds, and you captured them just beautifully! The more I watched those birds, the more I understood your words to be true. I appreciate the comments from a fellow watcher. Well done Classic Krahn! Beautiful and surreal, between the lighting and molten glass effect of the water. Keep fishing! This site is always a visual feast. What a wonderful description, especially the molten glass which I hadn’t thot of – thank you. The endearing classic Krahn phrase gives me an idea for a post that may see the light someday. This site has some loyal followers like you which make me grateful and humble. Wonderful images, Lyle. I too find fishing a sport I don’t get, but then again, I feel that way on golf too. We agree on two things then! Perhaps they are mutually exclusive interests. I really liked the middle picture; great detail, coloring and isolation of the subject. It takes someone who knows to say exactly why they like a photo. I appreciate your comments and insight. Awesome shots Lyle, I know how fast those terns are. I don’t have any pictures of them that aren’t just a big chunk of blur. I have a lot of blurry ones too. I guess it’s the the misses that make the others special. But boy do I wish I could move as quickly as they do! I appreciate that. I never seem to get tired of the combination of words and pictures. Exquisite shots Lyle! I agree with Mike the lighting is fantastic as it graces and outlines the birds. Thx. Yes the lighting just got better as the evening progressed. It was wonderful being there and capturing the moments. I appreciate that. It was one fabulous evening of photography that I have not come close to replicating. The lighting and the suspended water droplets are amazing and really enhance your incredible images of the tern. Most of the people who know me readily acknowledge that I have a warped sense of humor (that’s humour for you), so of course your narratives always draw me in. However to be fair to the fishermen–and I am not one of them–you could easily substitute “wildlife photography” for “fishing” in your posting and it would pretty well describe how we do what we do. We often go to inhospitable locations with mounds of gear and sit and wait and essentially do nothing, while trying to remain alert in case something does happen. I’m trying to figure how I could act more like a Black tern when I am out with my camera, but I think it would require me to turn into one of the paparazzi and chase celebrities rather than wildlife! A tern would make a great paparazzi. It would certainly have all the necessary moves to get into position. What fantastic shots, Lyle! Especially the first on! Geometric art at its best! Congratulations! Thank you. I hadn’t thot of it as geometric art but now that you mention it, I can’t see anything else! Always good to hear others’ perspectives on photos. That first one is my favourite of the bunch too.